In large bowl, combine soy sauce and cornstarch. Add chicken and toss to coat; cover and refrigerate 30 minutes. 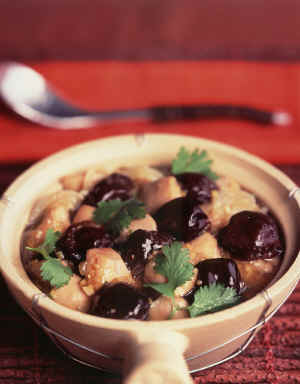 In medium saucepan, Asian claypot or sandpot over medium heat, heat 2 tablespoons of the oil until hot. Add ginger, shallots, garlic, chile, fish sauce and sugar. Cook and stir until fragrant, about 2 minutes. Add chicken; cook and toss 3 to 4 minutes or until lightly browned. Add chicken broth and dried plums; simmer 10 to 12 minutes or until chicken is no longer pink in center and sauce is slightly thickened, stirring occasionally. Meanwhile, heat remaining 1 tablespoon oil in medium skillet. Add onions; cook and stir 5 minutes or until onions are translucent. Mix into chicken mixture. Cook an additional 2 to 3 minutes. Remove from heat; sprinkle with cilantro before serving.